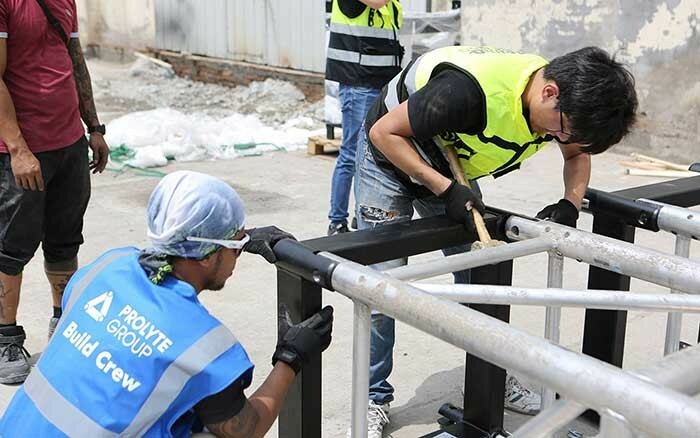 Asia-Pacific – Following its initial investment in Prolyte’s Mammoth ground support range of equipment, NeuroTech Asia has become the first owner of the Prolyte Space Roof System in the Asia Pacific region. Based on this initial success, NeuroTech began receiving more staging requests from large European companies for reliable and safe structures with tremendous load capacity. Seeing an opportunity to augment its structural offerings throughout the Asia-Pacific region, NeuroTech increased its commitment and purchased Prolyte’s Space Roof system. The Space Roof is a modular roof system based on a space frame structure. The aluminium profiles combine with unique node points to create a roof structure of any desired size or shape. The specially designed top canopy guarantees efficient water drainage and the ballast is an integrated part of the system, creating a reliable, safe and efficient way to add a counterweight to the structure. The roof can be suspended from standard Prolyte CT towers and can be built up to 37 x 22 metres in size, offered a loading capacity of 30t UDL + 2x 4T PA which was easily installed, which helps meet the needs of touring artists. 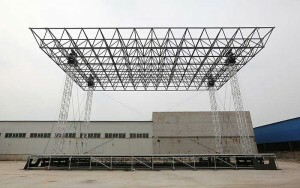 With reducing the stage opening (standard 31m), the loading capacity can be easily increased up to 50t. The space roof structure can also be easily adapted in size every 2.072m in width and depth. With maintaining the structural integrity of the system. “Having a space roof system available in the Asian market will give a new mindset and new opportunities for producers and organisers of Asian events,” says Ruud de Deugd, product manager at Prolyte. Until this time, there was no such structure in the Asian market. The requested structure needed quite a few adaptations to fulfill the needs of the show. Pre-rigs, extra steel beams, and extensions were used on the space roof and allowed for 1m square rigging points, which saved time during the rigging of the show allowing the full extended roof to be installed in two days, including stage and ballast.